Home » 25 Days of Giving: DreamCloud Mattress Giveaway! 25 Days of Giving: DreamCloud Mattress Giveaway! Day 6 and the giveaways will not quit. Today is your chance to enter to win a brand new DreamCloud for your bedroom! Click below for all the ways you can enter into the competition. 25 Days of Giving: DreamCloud Giveaway! The DreamCloud is an awesome bed in a box hybrid that provides great support and an impressive 15″ tall profile. I really like the DreamCloud for back/stomach sleepers as well as couples. To get all of my thoughts you can click the link to check out my full review of the DreamCloud. Out of the best latex mattresses you’ve reviewed, my favorite one is the Spindle. Thanks for the fantastic opportunity to win! 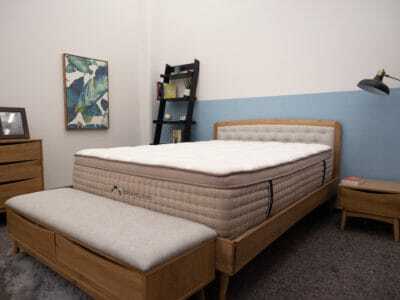 I like the Dream-Cloud review the most and would love to try out the mattress. I thought the Zenhaven was the best but this DreamCloud really sounds wonderful. Honestly, any of these would be big improvement on my current mattress. I have been looking at the Dreamcloud and sleepopolis reviews for months now but haven’t pulled the trigger. If I win this one and love it, I can replace all my mattresses in the home with a dreamcloud! My pokey bed springso say pick me, pick me. Thanks for the chance to dream. Hello…This bed looks amazingly soft & comfortable. I am 51 year old woman with bad back issues following a car jacking incident in which I was shot 10 years ago.I have had the same bed for 22 years now and need a new bed ASAP. I have been placed on disability because of all my injuries and can not afford a bed at this time, So once again I am hoping for a win. Thank you so very kindly for the opportunity!! Enjoy your Holiday Season Everyone!! The Dream Cloud has the layers and coils a true hybrid should have. Love it! Get a good night’s sleep. Sleep on a good mattress. love this! thanks for the review! The Zenhaven is probably my favorite LATEX mattress. This Dream Cloud looks, and sounds very nice! I’m sure it would provide us with a great night’s sleep!!! It would be a “Dream” to win the Dreamcloud Mattress! Thanks for the oppurtunity and Happy Holidays! My favorite is the Purple Mattress. Thank You..
Could certainly use a new mattress and this looks like a great one! I am impressed with the Purple Mattress review. I really like the cooling feature of the Zenhaven, so I would definitely pick that one! This is sleep goals for me!! Zenhaven, Purple or Avocado…..hmmm, hard to pick just one. But if I really must, Zenhaven! Good luck everyone and thank you so much sleepopolis for your holiday giving ! The Dreamcloud mattress looks perfect for my wife and I! Would be amazing to own! Love the way this mattress looks. I would love to win this mattress for my sister. I liked Zenhaven, but there were others that were just as good (Purple Mattress for one). I sincerely enjoy visiting your pages daily. You freely share a wealth of honest information that is so valuable. It saves time, money, resources, and is reliable (trustworthy). Your generosity is so admirable and speaks volumes to your character. I hope that each and every one of you @Sleepopolis has a Wonderful Christmas and an even better New Year. Sounds like it would be a great replacement for my husband’s Sleep Number mattress. They are all so amazing, don’t think I could choose! Winning this would be a blessing. Loom and leaf or casper still. I love the sounds of the Zenhaven. I get hot flashes at night so the cooling effects sound amazing. I also ;pve that it has the “pressure free support” to gently support key body areas without being uncomfortably firm. the dreamcloud mattress seems it would be so comfy and soft! Dream cloud hybrid looks and sounds heavenly!! My dream of a TempurPedic Dream Cloud is outside of my budget by quite a stretch lol, would LOVE this! I’m honestly almost ready to give up on my now 3 year mattress search, every one I really want is beyond my means and I’m afraid I’ll never find what I need to fit me. I really like the Nectar! Looks like this one would be really good for me. Happy Holidays and good luck to everyone! I love specific features of the various mattresses, however, the DreamCloud mattress is my fave. You are going to make me choose just one favorite!? I really like the Purple and the DreamCloud best. :-) Thank you. Dreamcloud is my favorite so far! sleepopolis thank you for this amazing opportunity! There are several I really like! I like memory foam but the Saatva looks very comfortable too. I’d be very grateful to win ANY of them to replace ours! This is making me sleepy. I don’t yet until I sleep on it for months. The Zenhaven seems best for me. Thank you for all of your detailed reviews! Love them all, but like the Dream Cloud really well. I love all of them! But, just the name Dream Cloud makes me so happy! Please and thank you for this opportunity. Happy Holidays to y’all! I love the fact this mattress is on the firmer side. My mattress is almost a decade old, Help! I would love to win a free mattress for my quest bedroom. The DreamCloud sounds like it was named perfectly. I imagine a having great comfortable sleep on this mattress. I don’t know that I have a favorite . I like all of the mattresses. I’m all about softness and I think this would be awesome for my son! as he really, really, needs one! This mattress sounds dreamy & Comfy! Another awesome and comfy mattress!! I would live the DreamCloud the best. But I also would love the purple mattress. I needed (not want) this Mattress so badly .. needed it !!! I’d love to win a new mattress for my family. Fingers crossed! A wonderful mattress. I would love to win it. To dream on a “DreamCloud Mattress”, perchance to win one! The Idle mattress is my favorite. Great stuff. I love this one! I like the DreamCloud mattress. Latex for Less is my favorite latex mattress I like the fact that it is a flippable mattress. I still like the purple, but this one looks pretty nice. Thank you for the opportunity to win one of your mattresses! I am super excited! Jeepers Creepers. A 15″ mattress. Spectacular!! I like the spindle for the all organic cotton but assembling at home does concern me. I like how Dreamcloud offers one free cleaning. I like that it sounds great for couples! And it sounds super comfy! Thanks for this chance. I like the avocado green mattress. I like the Purple mattress so far. They all look and sound so great! How does one choose? Dream Cloud sounds good to me! Thanks for the opportunity! Very educational info. and I had a dog named pepper too. I’m sore everyday I wake up and I think it’s the mattress. Definately great for a guest room..not sure on everyday use..say after 10 years..I’d get it for a guest room.. The Casper Wave,Nectar,Purple and Helix mattresses are my favorites because I am a side sleeper. The Dream Cloud, the Avocado and the Hybrid one all sound so wonderful! In all honesty at this point any of the mattresses would be my favorite as we need a new mattress really bad. I toss and turn all night. I have bulging discs in neck and lumber. Sacrolilic joint dysfunction,hip bursitis,slight scoliosis,pelvic nerve issues and fibromyalgia. There’s more but you get picture. I believe I would need a firm mattress that has like the pillow too for that bit if cushion. I would love to have a mattress that helped me get more than an hour sleep at a time. I love the ghost bed! Will definitely be picking one up to replace my worn out mattress once my budget allows. I like the Spindle mattress. I have to say this DreamCloud may be my new #1 when it comes to your mattress reviews. From top to bottom this gives me the “Wow” factor I am looking for. Sure could use this for my son’s bedroom in a twin size. I need a mattress to keep me cool while I sleep. I could use this mattress! The DreamCloud mattress looks comfy yet sturdy. This mattress could be one I need to sleep throughout the night. After seeing the DreamCloud mattress on another site I was hopeful it would be a bit more of a medium firm, or even slightly soft given the name. Seems wonderful other than the firmness. Would love to win such an awesome prize! Thanks again for letting us all have a chance to win! I really like the review on this Dream Cloud Mattress. Looks so comfy. Trying as hard an as often as I can to win my daughter a new mattress. I’m a big gal 260lbs as of now and I’m a forced back sleeper and sometimes side sleeper due to back surgery. I run hot and wonder if this mattress would be a good fit for me? I’ve been interested in trying DreamCloud but it seems like it might be really firm. Plus it looks super heavy with that tall profile! I wonder if it feels like sleeping on a cloud? Dream cloud is my favorite! So far, my favorite has been the Helix, but I also like the DreadCloud. Maybe this time I will win. I just discovered your site today while researching adjustable beds. I have a general question about mattresses for adjustable frames. Are they squishier than the average mattress, since they are required to bend in 2 places? I am a bit advanced in my years and I prefer a firmer mattress. I’m wondering if perhaps that’s just not possible with an adjustable frame. Thus Dreamcloud Mattress is great for back or stomach sleepers, and it will give you a great night’s sleep. Would love to win it! It’s really hard to choose from but I’m stuck between the Leesa mattress & the DreamCloud mattress! I would love to win and try and review any of your sleep products!!! I like the layla and purple, not to leave out the bear. Now this dreamcloud sounds great! I’m so confused! I’m hoping to win one of these mattress giveaways. Our guest bed is 10+ years old and our new bed is a cheap one just so we can replace our old one. Thank you for the opportunity! My favorite mattress is the Zenhaven. I’m a side sleeper and I think it would be the best mattress for me. Thank you !! Omg we want the dreamcloud. Need it! Dream Cloud sounds good to me! This one looks super comfy!